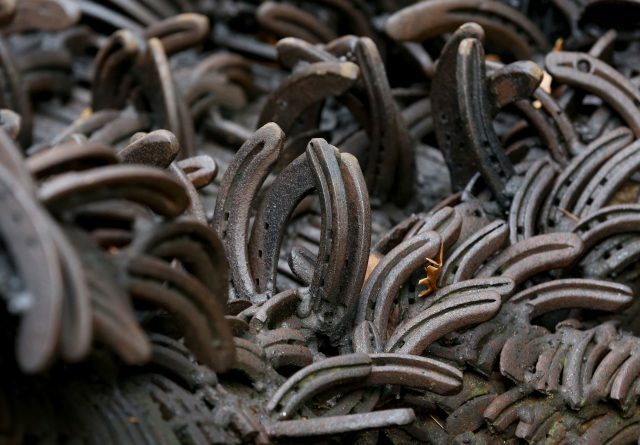 Artist Jim Poolman spent 12 years and used 50,000 horseshoes to create a record breaking Horseshoe Dragon sculpture. Horseshoe artist Jim Poolman contacted Eddie Powell, owner and curator of The Sculpture Park in Churt, just outside Farnham, Surrey, 12 years ago. He was disappointed that he couldn't sell his work there. “What would you exhibit?” he asked Eddie. “It needs to be bigger, how about a dragon?” was Eddie's response. 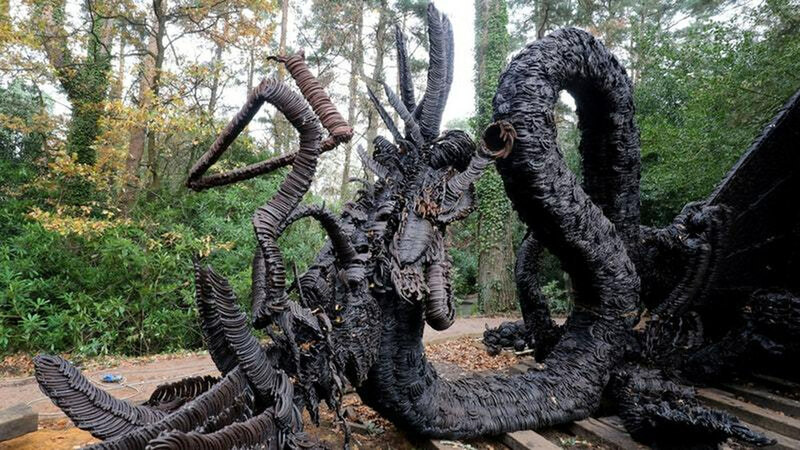 12 years later, Jim called Eddie again this summer and announced that he had finished his masterpiece of exactly that, a horseshoe dragon. 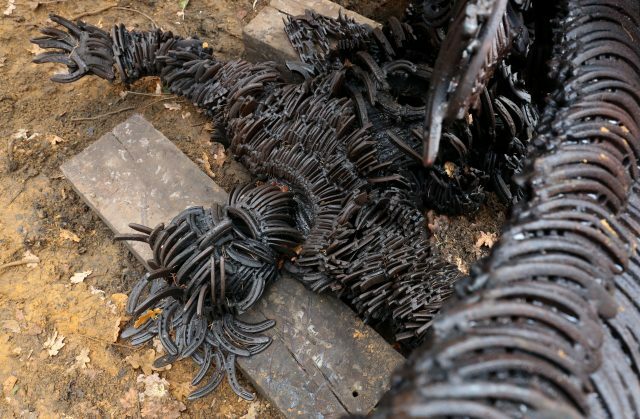 The fantasy dragon is made of over 50,000 horseshoes. Some are cut in half or smaller pieces. It weighs an impressive 17.816 tonnes. 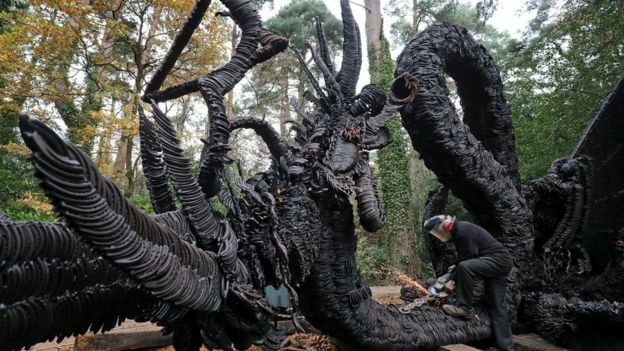 Jim has spent more than 10,000 hours working on his horseshoe dragon sculpture and used old horseshoes from a team of Hampshire farriers over that period. Jim states that his work evolved over the years and he created a fantasy world with it. 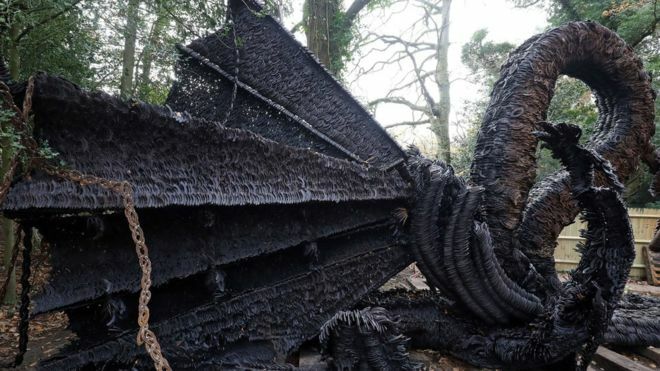 The flying dragon was forced to crash when the peasants were throwing clods of turf, bricks, balls, chains and arrows. It injured its wing, but managed to catch one of the antagonists and, with its mouth wide-open and eyes popping out, the dragon came down roaring and spitting flames. There are also some fantastic beasts surrounding the dragon, a maiden sitting on a termite-like mound stroking two strange animals and odd mounds that hint of a long gone strange land. “A complete horseshoe is quite limiting in what it can be made into, but the small parts are remarkably versatile and highly effective in recreating the appearance of skin, feathers, bone and muscle,” Jim explains. Once cut in smaller pieces, the parts are then MIG welded together. Using only a small forklift truck, scaffolding and other apparatus, either custom-made by Jim himself, or derived from his mechanical background, Jim has painstakingly continued this monumental craft effort over the years. He has suffered for his art, having burnt vast quantities of clothing, and suffered various injuries and wounds in the process. Jim Poolman, a trained mechanic and self-taught welder, has been sculpting with steel for over three decades. 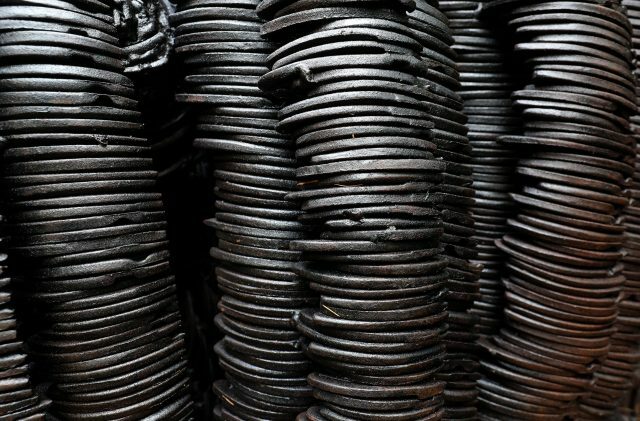 Jim mined the untapped resource of used horseshoes and has been creating works from them based upon everyday furnishings and various mystical creatures. The horseshoe dragon is now installed at The Sculpture Park to be admired by thousands of people in its full glory. A farmer’s son, born and raised around Windsor, Jim left school at 15 to begin an apprenticeship at a Ford tractor dealership, going on to work in a factory in development of 4wd tractors. Gaining a NDagri E diploma at the West of Scotland Agricultural College, he spent a year on student exchange with the British University’s North America Club travelling and working in the USA, including Mexico, Belize, Guatemala, Canada and Alaska. Travelling home on the QE2 and back to reality, Jim joined a Chrysler main dealership, then on to a newly founded vehicle range from the Dutch DAF company. Recognising the potential of the product range, Jim set out on his own and founded Orlando Engineering in Eversley, Hampshire as a service centre. Future side projects included the manufacture of aeroplane hangers and a venture into an off road vehicle called The Ant. Throughout this time, Jim has had an active interest in art and design and spent his spare time painting and sculpting a variety of works, predominantly in steel. 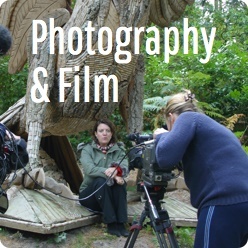 Jim lives with his wife Anita on the site of the existing business estate and has three children and seven grandchildren. 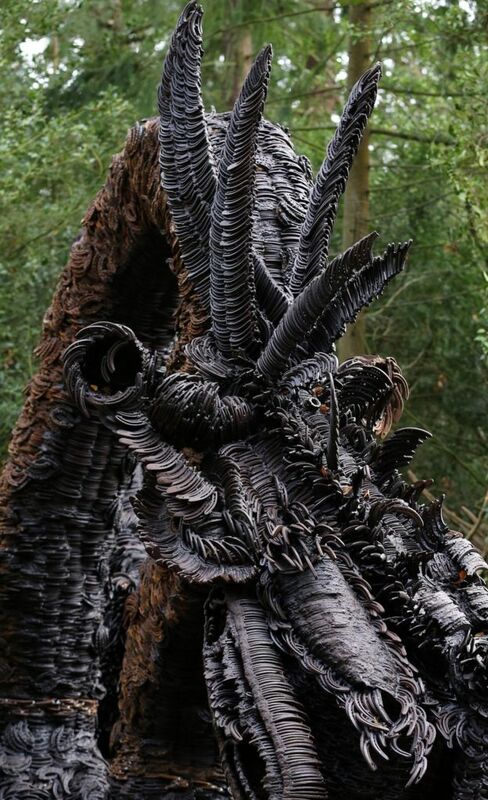 This entry was posted in and tagged Sculpting, sculpture, Sculpture Park, sculptor, animal sculpture, metal sculpture, Sculptures for Sale, Things To Do in Surrey, Record Breaking Sculpture, New Sculpture, Dragon Sculpture, Jim Poolman on 9th January 2018 by Charlie.